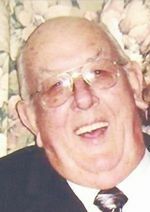 Hugh N. Edwards age 74, of Ashland, OH., passed away Wednesday, October 28, 2009 at his residence. On February 1, 1935 in Tallmadge, OH., Mr. Edwards was born and raised by his grandparents, Ralph and Elva Edwards. He had been a resident of Ashland Co. for over 50 years where he worked as a truck driver for 35 to 40 years retiring from Cowan Trucking. Formerly he drove school bus for the Ashland City Schools, worked for Donley Feed Mill and Guy's Goodyear. Mr. Edwards served with the US Air Force during the Korean War and enjoyed fishing and model airplanes. On September 20, 1958 Mr. Edwards married Mary Robinson who survives. Also surviving are a daughter, Candus (Allen) Wright of Ashland; 3 sons: David W. (Jody) Edwards of Ashland, John R. (Tammye) Edwards of Polk, OH., and Kasey N. (Michelle) Edwards of Loudonville, OH. ; 11 grandchildren; 4 great-grandchildren; and a brother, Mike (Kathy) Meluch of Ashland. Mr. Edwards was preceded in death by his mother, Mildred Meluch and his grandparents, Ralph and Elva Edwards.